Whip up my easy and buttery Shortbread Cookies recipe with just three simple ingredients. One of the best parts about being a Bold Baker is having lots of sweet tricks up your sleeve. For me, that means having loads of easy cookie recipes I can pull together at the drop of a hat without ever having to open a cookbook. 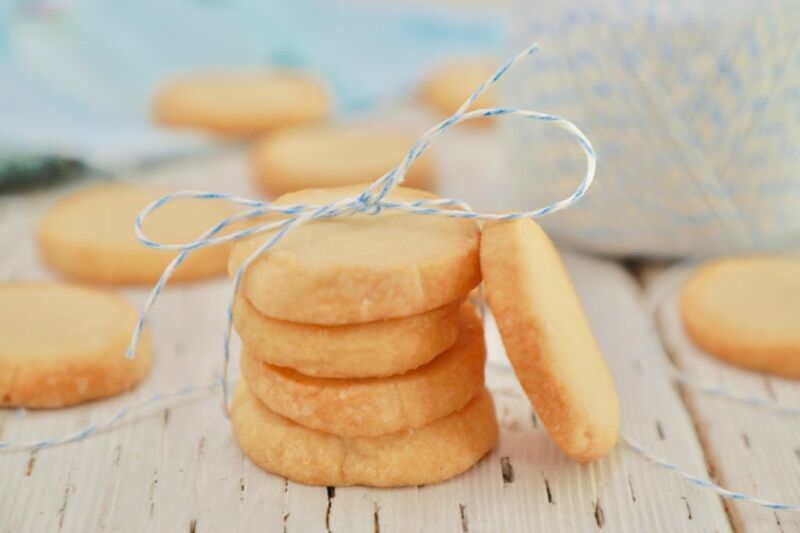 These wonderful Shortbread Cookies are one of my go-to recipes for a classic buttery fix. I can make this simple 3,2,1 recipe off the top of my head and now you can too with my shortbread cookies recipe! For those of you who don’t know, a 3,2,1 recipe is a recipe which has only 3 ingredients and a ratio of 3 parts to 2 parts to 1 part (ratio applies to cup measurements only). These 3 Ingredient Shortbread Cookies are mostly flour, the third part. Then some butter, the second part. Lastly a bit of powdered sugar, the one part. And for those of you who do not use eggs – not an egg in sight! All you have to do is mix up the dough, roll it into a log, let it chill and then slice them into perfect little rounds. There is something so satisfying about both making and eating these lovely 3 ingredient cookies. On top of being an incredibly versatile and easy recipe to remember, these easy Shortbread Cookies are made in just one bowl and bake up super fast. All you have to do is mix up the dough, roll it into a log, let it chill and then slice them into perfect little rounds. The finished cookies bake up to golden brown perfection with a super crumbly and rich texture thanks to all that creamy butter. While I love to enjoy Shortbread Cookies all on their own, there are so many things you can do with them: make them into shortbread thumbprint cookies with a bit of jam, fill them with peanut butter to make shortbread and peanut butter sandwiches, dip one half of them in chocolate – the possibilities with shortbread are endless. Enjoy buttery and delicious Shortbread Cookies with my easy 3 Ingredient Shortbread Cookies recipe for all of the flavor with less of the fuss. Preheat your oven to 350o F (180oC) and line a baking tray with parchment paper. In a large bowl cream together the soft butter and sugar with an electric mixer until light inf fluffy. Add in the flour and mix until the dough just comes together. Turn the dough out onto a counter dusted with powdered sugar and gently roll the dough into a long two by two inch log. Wrap the log of cookie dough in plastic wrap and allow to firm up in the fridge for 30 minutes. Once the dough is firm slice the cookies into 3/4 inch thick rounds. Place each round on your baking trey and bake for 16-18 minutes or until just golden. Allow to cool slightly before transferring to a cooling rack. Once cool the cookies can be stored in an air tight container for up to 3 days. If you do not use butter, though this is best for these cookies, you may use a hard baking margarine, not the spreadable tub one. I loved this easy to follow shortbread recipe! I mixed it up a little by adding a splash of vanilla, strawberry extract, as well as crushed up freeze dried strawberries. Then I dipped them in white chocolate. I took them to a baby shower and they were a big hit! I’m submitting a photo as well so you can see. YUM, great job! Next time send us a photo! I was looking for a classic shortbread recipe and this was it! I love their simplicity and versatility; thanks for sharing! Can I add milk powder to the mixture? Hi, there is no need to. Thank you for reminding me how much fun baking can be. I’m delighted to hear that! Great job! I have already tried ur recipe and it was a hit..but I might have to travel with these cookies that I’m making for someone..so I would love for you to answer these questions pls..
1. Do these cookies go bad after 3 days? 2. Once the dough is prepared do we have to store it in fridge or freezer? 3. If we have to store the dough in freezer can we bake them directly with the freezer temp or do we have to let them cool down a bit? Hi, they will keep or up to 4 days. In terms of freezing them, i would thaw the dough then bake. Great questions, enjoy! I only have a stick of butter and no way to get anymore right now. Can the recipe be cut in half by just halving each ingredient? Will that work okay? You know the rules here at BBB, you have to share! haha that is the way to do it, winning friends in the process! YUM, i love those additions! How is this recipe 3 2 1? Shouldnt it be 2 oz 4 oz and 6oz? I’m just curious because I will not use cups anymore. It’s just not accurate. I weigh everything… so what do you suggest? And can I use this in millionaires shortbread? Hi, my recipe is slightly different but traditionally it is a 3 2 1 recipe. This can be made into millionaires shortbread yes, great idea! Good day. May I know how long these cookies are good to eat and how long they can be kept? Any baked cookie will keep well for a week or so, when stored in an airtight container, in a cool place. Hi there, great job! Sorry to hear that! Let me know what step is giving you trouble! Hi, you can add 1/4 teaspoon of salt. You could try a wheat free flour like sorghum or you could try a nut flour. Just notes changing the flour might give you a drier cookie mix. I made these delicious shortbread cookies and named them Irish shortbread cookies because I used Kerrygold pure Irish butter. I didn’t have any powered or caster sugar so I ground granulated down to a powder. Ivor, you cannot get better than Kerrygold butter! I grew up with this, and still use it as much as I can. I am delighted, they truly are Irish now! Tried these using cake flour (was that wrong) laced with lemon zest, cinnamon and nutmeg. Alas these didn’t have any structure and never browned in the oven. Just crumbled to, admittedly tasty, dust. Too much butter methinks. Trying to rescue the remaining dough to a more traditional 4-2-1 shortbread recipe. Hmmm yes i would not suggest cake flour here, but i’m glad they still turned out tasty! 😀 i am delighted to hear that! I would like to try your recipe for the shortbread, but I don’t have any electric mixer.Is it still posible to make a good dough without electric mixer? Yum!! And so easy. You’d be hard pressed to find a worse cookie baker than me. Usually you’d break a tooth on my cookies, but these turned out perfectly. Thanks Gemma for another tasty and super easy recipe that whips up in no time. Having to cook absolutely every single meal from scratch in my house these quick and easy treats with few ingredients are perfect. You see, you are not a bad cookie baker, you just did not have the best recipe! Now you are an expert you can try more cookie recipes, then you really will be an expert! I have been looking for this 3-2-1 recipe for months. Have always wanted a simple but easy to remember, no-fail recipe. Made them last night and they were wonderful! They are so simple yet are perfect to be a springboard for varying flavors and experiments. I think I will try coconut next! YUM i love the idea of coconut, great job! Can I use pastry flour for this shortbread cookies? Will it be too soft or crumbly? I would like to ask what if I want to make these in a microwave of 1200 watt? How much time and power should I set? I would not do this! I think this type of cookie depends on the ambient temperature of the convection oven. You would not get the same result. I have some microwave mug cookie recipes here (https://www.biggerbolderbaking.com/cookie-recipes/). This is a little quantity, and you could try to bake in open, on a sheet, to test it. This will be an experiment for you, and should work well. Test after 40 seconds or so. What about using almond flour? I’m low carb and avoid traditional flour. Used your recipe for sugar cookies but I turned it into pecan sugar cookies by adding finely ground pecans and cinnamon to the dough. My family loved them. Their favorite dessert is peanut butter cookies, apple pie and banana bread. Now I can alternate with my pecan-cinnamon cookies. Try this. I’m sure you too will enjoy them. Wow, great job i love how you adapted these, next time send us a photo! These are ridiculous, set the plate out and they were devoured. made again, same thing! Be warned, these can be highly addictice especially if dipped in dark chocolate laced with orange zest. Quite simply, this recipe should just be called Baked Butter! Hi, Gemma, I’d like to try the shortbread recipe. Question; if I chill the unbaked dough log in the fridge for a day or so, for approximately how long would I let it sit out on my counter to return it to the temp. of 1/2 hour of chilling? Thank you! Hi, yes i would say 15-30 minutes. Enjoy! Hi Gemma. Am reading these wonderful comments and can’t wait to try these shortbread cookies. Several members of my family are diabetic and need to watch carbs. Will these cookies work with Splenda? I am worried about wasting so much butter if the cookies will not turn out good. What do you think? Oh that is a good question. I think you will be ok but maybe could you use coconut sugar instead of splenda? you need to have the volume of the sugar in this cookie. Hope this makes sense. Hello there Gemma. I chilled my dOuGh but they still spread. Argggh. And Should the butter be unsalted? Hi Christine! Salted or unsalted butter will work fine. It’s a preference. Was your butter melted? Let me know and I’ll see how I can help. If you store them in an air tight container they will be fresh linger, i would say up to 5 days. Enjoy! Hi Gemma. Thanks for the reply & wanted to let you know…I LOVE this recipe! They came out perfect & delicious. Never made shortbread before nor even looked up a recipe because I thought they’d be one of those time intensive, if at first you don’t succeed kind of cookies. You have now changed that. Can’t wait to make them again & play around with variations like others have. Thanks again & a Merry Christmas to you. I am delighted to hear that, enjoy these and have a lovely holiday! Looks YUMMY! If I wanted to use a mold, what adaptations would I need to make? THANK YOU!! I saw the mold but removed the link. Very nice mold! You will need to oil the mold, lightly, and have the batter a little firm, other than that it should work well for you. If the dough feels a bit sticky add a little more flour. Try a little sample, and bake it in the mold, it will help to season the mold for you. I hope this works well for you, do let us see the results. 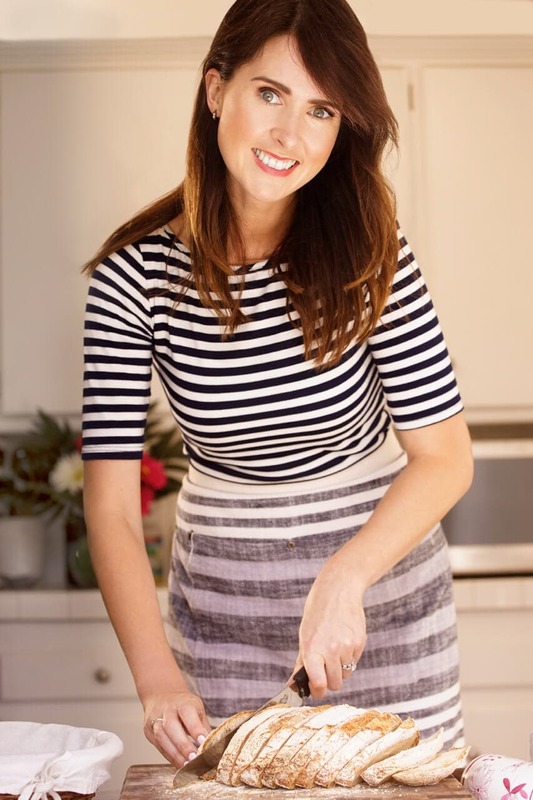 I am one of your newest fans and absolutely love your work and your recipes. I made this 3 ingredient shortbread biscuit recipe last night and added crushed almonds. It was absolutely delicious!!! Good for you, very well done, it is great that you are willing to experiment with the recipes, that is the idea. Hi Gemma can I just drop them by the teaspoon and bake them without chilling the dough first. And do I grease the cookie sheet? I highly suggest you chill your dough as this will keep the cookies from spreading. Hi how are you? I wanted to ask can this shortbread cookie be made in a microwave? like the other microwave cakes? Hi! Would this work in a cookie press? Hello! Can I add almond or vanilla extract? If so, how much? Thank you! sure you can, a teaspoon of either one would be good, especially if it is an extract. I just made these shortbread cookies tonight I added coconut flakes, pecans and almond extract. nice! I hope they turned out well.